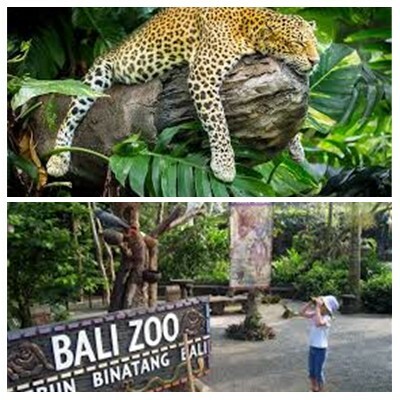 Bali Zoo Park Tour is a Bali Activities Tour to enjoy visiting private zoo own by Balinese with 130 staff and works together as a family, the zoo set in 12 acres lush tropical garden and flowers surrounded. Very up market Bali Zoo Park with 100s quality build habitats including petting area for animals, walk through bird aviaries, Gibbon Islands, and Komodo Dragon cage and latest open range for african lions den. Bali Tour set out to provide an experience for our visitors that like no other. One of Bali Zoo Park aim is to encourage interaction between our guest and the animals. It’s a truly Hands-on Experience. The Bali Zoo Park invites the public to get “Zoological” with Wildlife in Paradise. At the Bali Zoo Park, getting Zoological isn’t just about having exotic animals in eco-friendly habitants, nor is it only about allowing guest to be interactive and hands-on, feeding and riding elephants, petting deer, playing with rabbits, and getting up close and personal in holding snakes, baby crocodiles, and bear-cats, nor is it just about seeing birds shows and lions, tigers and bears up close, it’s all of these things and more. Bali Zoo Park also offer Romantic Dinner for your holiday by offer Night at The Zoo packages. Imagine those times when man lived in the jungles of the world, and each evening, the uncertainty of darkness would fall to both man and animal. Begin by feeding the elephants as they are at their most playful at the end of the day. Then get to hold and take pictures with Borneo bear cats, pythons and a freshwater baby crocodile before touring the zoo, enjoying dinner under the stars and a fire show. This is the perfect fun date night for lovers of all ages, for friends or the whole family – exciting for children of all ages. Get up close and personal for a petting and photo session with our assortment of exotic fauna. See what the scales on a fresh water crocodile and python or the fur of a binturong and tiger cub feel like then have your photo taken with these tame creatures. Come and experience Bali’s most unique photo opportunity as you sit up close and personal with our tame tiger cubs, crocodiles, binturongs, pythons and more during our animal encounters session at Bali Zoo Park. Watch our African lions, tigers and crocodiles come alive as you feed them for this exclusive Bali opportunity. Or treat the entire family to a unique chance to hand feed our tame wallabies, deer, gibbons sun bears and more. You can buy fruit for the animals at next to ticket counter to feed wallabies, deer, gibbons in gibbon islands, sun bear, orangutan, camels, etc. And also have a go, feed our wild animals such as crocodiles, tigers and lions at Bali Zoo Park. The whole family will enjoy this opportunity to visit our special zoo pen where kids can pet our domesticated baby rabbits and Muntjak Muntiacus, Sitatunga and Timor deer. Interact with these gentle animals while learning about their behavior. Invite your children to interact with and pet our gentle baby animals and learn about their behavior. Kids can experience touching and hand-feed some of our domestic animals (rabbit, baby deer, horse) at Bali Zoo Park. Bali Zoo Park is excited to offer a fun and unique new alternative start to the day; Bali’s first and only “Breakfast with Elephants at The Zoo“. This programme starts with an early morning pick up at the hotel and a journey to the Bali Zoo Park in the Zoo’s distinctive van. Upon arriving at the Bali Zoo Park, the wild has just woken up and, along with the amazing sounds of the gibbons and birds’ dawn chorus, guests will be welcomed by our gentle giant Sumatran elephants who host you at their playground for breakfast. Starting with croissants, Danish pastries and a fresh tropical fruit salad with yogurt, choice of all American breakfast, Continental breakfast or Balinese style nasi goreng will be served along with choice of tea, coffee and fruit juices. Whilst enjoying the most important meal of the day, guests can also observe the close bond and interaction of the magnificent creatures with their ‘mahout’ and be amazed to learn how close the connection is between the ‘mahout’ and their elephant. Once breakfast is concluded, hop on and enjoy a ride on top of the elephant’s back where they will take you on a tour around their home. You will experience an unforgettable enjoyment of having the rare and extraordinary adventure of riding the biggest walking mammal on Earth. After the tour, guests will be taken back to the starting point where a memento as a friendship token of the treasured moments together with them during your visit be presented, as the elephant’s now consider you as one of their new close friends. Elephant Ride: 09:15 -10:00 am 30-minute elephant ride. The Kingdom by Night…As the day cools, the sun sets, and twilight takes over, prepare yourself for a completely unique island adventure tour where you are invited to enjoy, observe and interact with our exotic assortment of animals in their nocturnal habitats. Begin the evening’s escapade at the Bali Zoo Park with our elephant encounters and feeding experience. You’ll meet our gentle pachyderms and see how it feels to actually feed these amazing mammals by hand. Then head over to our restaurant for a petting and photo session with our tame Borneo bear cat, scaly python and even a Sumatran Sinyulong freshwater crocodile. Continue your tour with a guided walk through the Bali Zoo Park in which your senses will come alive to the natural sights and sounds of our tropical menagerie at night followed by a dramatic fire dance performance to entertain you before dinner. Your special evening concludes with a sit down al fresco feast under the stars next to our open-air lion enclosure where you’ll be dining only a few meters from our resident king of the jungle and his pride of adorable lion cubs. Whether visiting as a couple or with the entire family, we can guarantee that your Night at The Bali Zoo Park will be one night to remember. Hotel return transfers, night zoo admission, hand feeding the elephants & animal encounters, fire dance show, set menu dinner, and insurance. elephant ride, zoo admission, lunch/afternoon high tea*, fresh coconut, hand feed the elephants, animal encounters, souvenir, insurance. hotel return transfers, elephant ride, zoo admission, lunch/afternoon high tea*, fresh coconut, hand feed the elephants, animal encounters, animals show, souvenir, insurance.